Beverage giant Coca-Cola South Pacific has announced the launch of Barista Bros, a premium flavoured milk brand that marks the Company’s first entry into the flavoured milk category in Australia. Coca-Cola South Pacific said the product had been “inspired by the passion of baristas and Australia’s growing café culture”. Barista Bros has launched with two flavours: Iced Coffee and Double Strength Iced Coffee flavoured milk. Coca-Cola South Pacific said the products are made with 100 per cent Arabica coffee. 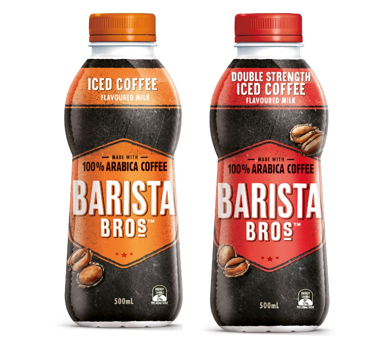 “We’re excited to launch Barista Bros and deliver Aussies with a great tasting Iced Coffee flavoured milk inspired by Australia’s modern cafe scene and its passion for quality,” said Karen Kresner, Barista Bros Marketing Manager. “While we don’t take ourselves too seriously we’re serious about delivering to market a premium flavoured milk brand with a focus on quality and taste,” she said. “We have seen large growth in the flavoured milk category and are excited to make an impact at launch with our first national foray into the category in Australia,” Ms Kresner said. Barista Bros will be available in a 500mL product size at launch across major channels in Queensland in June 2014 and nationally in the coming months.